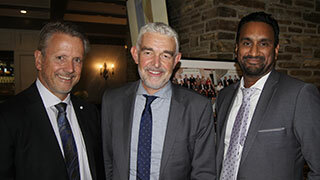 TICO CEO Richard Smart (l) with Kevin French, Deputy Minister, Government and Consumer Services; Glen Padassery, Assistant Deputy Minister. Tracy MacCharles, Minister of Government and Consumer Services for Ontario, has introduced new legislation to strengthen consumer protection when purchasing travel services in Ontario. The legislation is part of a larger consumer protection bill – dubbed the ‘Strengthening Protection for Ontario Consumers Act’ -- and comes as a result of a recent review of Ontario's Travel Industry Act, 2002. Richard Smart, President and CEO of Ontario travel regulator TICO, believes the legislation, if passed, will be good for travel agents as well as travel consumers. "It is encouraging to have a major Bill tabled by the government that enhances consumer protection while reducing burden for businesses and strengthening the marketplace for registrants. The industry has changed significantly since the legislation was introduced and, if passed, these changes should benefit all stakeholders." The new rules are aimed at increasing consumer confidence and protection when making travel purchases. The Bill would amend the Travel Industry Act, 2002 to recognize changes in the marketplace, such as online purchases and advertising by out of province travel businesses targeting Ontarians. It would also create new registration requirements for individual travel salespersons and introduce new enforcement tools including administrative penalties to assist TICO to effectively administer and enforce Ontario's consumer protection legislation. Enabling the creation of new rules for representation, such as advertising by out of province travel sellers who target Ontarians, and creating new registration requirements for individual travel salespersons. Lessening the burden on travel businesses by creating a new class for travel sellers so that businesses would no longer need to register as both a travel agent and wholesaler. Improving compliance with the rules by enhancing enforcement tools, such as administrative penalties. Strengthening consumer protection by requiring registered travel sellers to disclose additional information to consumers so they can make informed choices and requiring continuing education for travel salespersons. Lessening the burden on travel businesses, the majority of whom are small businesses, by updating requirements, such as financial reporting and security deposits. The proposed changes to the Travel Industry Act are based on a multi-phased consultation process that included input from the public and travel industry stakeholders. If the Bill passes, the Ministry will consult with stakeholders on the regulations and additional measures aimed at lessening the burden on small business, including proposed changes to financial requirements.